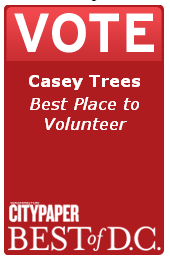 You've volunteered with us, participated in our free classes and tree tours, received trees and planting help, read our blog and e-newsletter and now we are asking you to show us a little love by voting us Best Place to Volunteer AND Best Non-Profit in the Washington City Paper's 2012 Readers' Poll. 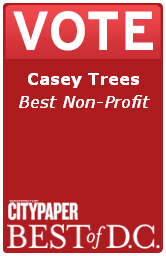 It helps spread the word about Casey Trees' programs and the importance of trees, recruit new volunteers, secure critical funding and add more trees across the District. Plus everyone loves a little validation. Voting takes just a second so vote us Best Non-Profit AND Best Place to Volunteer now and encourage your friends, family, coworkers, household plants and pets to do the same. All that is a needed is a valid email account! Poll closes March 1 at 11:59 EDT.